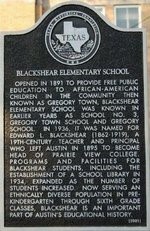 Blackshear Elementary School opened in 1891 to provide free public education to African-American children in the community then known as Gregory Town. Blackshear Elementary School was known in earlier years as School No. 3, Gregory Town School and Gregory School. In 1936, it was named for Edward L. Blackshear (1862-1919), a 19th-century teacher and principal who left Austin in 1895 to become head of Prairie View College. 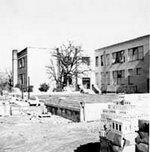 Programs and facilities for Blackshear students, including the establishment of a school library in 1934, expanded as the number of students increased. Now serving an ethnically diverse population in pre-kindergarten through fifth grade classes, Blackshear is an important part of Austin's educational history. Location. 30° 15.996′ N, 97° 43.324′ W. Marker is in Austin, Texas, in Travis County. Marker can be reached from East 11th Street, on the right when traveling west. Click for map. Marker is at or near this postal address: 1712 E. 11th St, Austin TX 78702, United States of America.